The “Water and Business” event started with a plenary under the thematic of “Contextualizing the global water challenges and the private sector’s role in addressing them: the business scenario for water security and sanitation issues”. The plenary discussed how companies and civil society organizations are handling imminent risks of water scarcity and lack of basic WASH services in different areas of the world. Jason Morrison (President of the Pacific Institute and Head of the CEO Water Mandate) was a speaker in this plenary together with Oscar Cordeiro (Director of Regulation – Brazilian National Water Agency) and Tom Williams (Director for Water – World Business Council for Sustainable Development). The event brought together Brazilian and international professionals and companies, and also included academia, experts, and international organizations. Discussions at the Water & Business event centered around water challenges, public policy, existing solutions and technologies in Brazil and globally, and specifically the UN’s Sustainable Development Goal #6 on water and sanitation. Learn more about solutions that are being implemented by companies to improve access to drinking water in Brazil: Companies such as Ambev Brewery (AMA mineral water), Coca-Cola (Access + Water), and Nestlé presented their initiatives to improve water use efficiency in their operations and expand access to water in Brazil, beyond the borders of their plants and the companies themselves. Their initiatives are great examples of collective action efforts involving a variety of stakeholders, including the private sector, government, and civil society. Through the outcomes shared it is possible to confirm that collective action efforts are critical to promoting water security in Brazil. Understand how the productivity and competitiveness of the industry can be affected by water crises and what measures are being taken by industry in Brazil to cope with this issue in order to avoid impacts on production and the sale of products. Discuss how the private sector can effectively contribute to improving access to sanitation in Brazil and how this sector can provide a wider support to the government to overcome the challenges related to sanitation in Brazil. Learn more about solutions and initiatives that are being implemented by companies to improve access to sanitation in Brazil: BRK Ambiental recently launched a report in partnership with the Instituto Trata Brasil which shows that one in four women do not have adequate access to treated water, sewage collection, and treatment, and that universal services would immediately take 630,000 women out of poverty in Brazil. Additionally, BRK Ambiental launched a website supported by UNGC Network Brazil that shows some data from this study. This video presents a real story of how access to sanitation impacts the life of women in a city called Uruguaiana, located in the south region of Brazil. Discuss what strategies should be adopted in order to guarantee service to the low-income population, while still promoting an expansion of water and sewage services towards a universal service. It was pointed out that tariffs are an important instrument for the investment capacity of companies that provide services such as water and sewage. Discuss ways to increase investments in infrastructure in Brazil. It was pointed out that it is necessary to stimulate the role of private banks and the capital market in projects, and to reassess the role of public financing. More investments in sanitation are necessary to achieve universal access in Brazil. The average annual investment between 2010 and 2017 was R$13.6 billion (around USD 3.5 billion). According to the CNI (2018), the average required to achieve universalization in 2033 is almost R$22 billion (around USD 5.6 billion). To reach the average level of investments required for Plansab‘s target, investments would have to increase by about 60% (CNI, 2018). 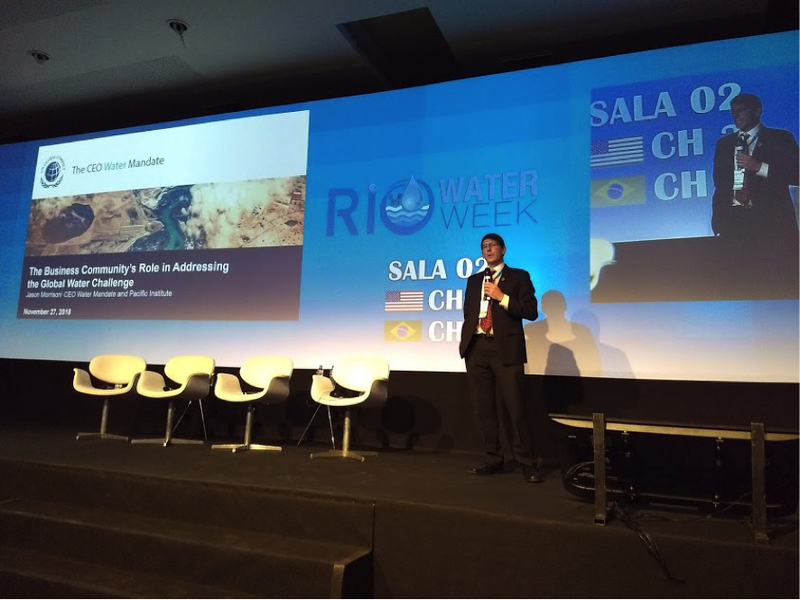 In light of what was presented and discussed, starting with the 8th World Water Forum and more recently with the Rio Water Week, it seems that Brazil has a long and winding road to achieve water security. However, we have laid the groundwork and started an awareness process culminating with the creation of collective action efforts from a variety of stakeholders, including the private sector, government, and civil society, in order to to meaningfully advance water security in Brazil.